When he heard that the young novelist Evelyn Waugh would be coming to Asmara in summer 1936 to report on the effects of Mussolini's invasion of Ethiopia, Waugh's Italian Press Bureau contact hurriedly hunted down a bouquet of red roses. "Like many others before him," wrote Waugh in Waugh in Abyssinia, the nonfiction account of his stint as a war correspondent, "he was deluded by my Christian name and for two days flitted between airport and railway station, meeting every possible conveyance, in a high state of amorous excitement. . . . The trousered and unshaven figure which finally greeted him must have been a hideous blow." The man's confused ardor can be excused. At the time, the Eritrean capital's white population of 60,000 included only seven unattached women, and Waugh's two best-known novels (Scoop, his fictional spin-off of that same war correspondence, easily the funniest spoof of journalism ever written, and Brideshead Revisited) were still in the offing. Today's well-read traveler ought to know better. Waugh (1903-66) was not merely a stellar satirist and literary stylist; he also produced some of the great English travel writing that flourished between the World Wars. Late last year, to celebrate the Waugh centennial, Everyman's Library brought out two new collections of his work. One bundles Scoop with three other novels: Black Mischief, The Loved One, and The Ordeal of Gilbert Pinchfold. The other, Waugh Abroad, is an unabridged compilation of his seven book-length travel narratives. The travel book is more of a gamble, given the susceptibility of all travel writing to becoming dated — and the uneven quality of Waugh's work in that line. His first four travel narratives, though, remain standouts in the genre. Remote People centered around his trip to Ethiopia to report on the coronation of Haile Selassie, and inspired Black Mischief. Ninety-Two Days documented a 1933 trip through the jungles of British Guiana and Brazil and spawned the Dickens-obsessed Mr. Todd in A Handful of Dust. 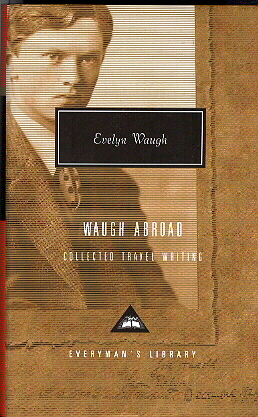 Waugh's best travel book was probably his first, Labels, which recounted a touristy cruise of the Mediterranean he took with his first wife (also named Evelyn) when he was 25. Waugh's strength in travel writing was in the comic set pieces that resulted from the clash of his personality — conservative, Roman Catholic, aggressively English, snobbish, acerbic — with unfamiliar people and cultures. In Labels, for instance, he decides to put ashore in Naples one Sunday morning to view the cathedral. "As soon as I landed, a small man in a straw hat ran to greet me, with evident cordiality. He had a brown, very cheerful face, and an engaging smile. "I said, no, not quite as early in the day as that. "I still said no, and he went on to suggest other diversions rarely associated with Sunday morning. In this way, we walked the length of the quay as far as the cab rank at the harbour entrance. Here I took a small carriage. The pimp attempted to climb on to the box, but was roughly repulsed by the driver. I told him to drive me to the cathedral, but he took me instead to a house of evil character. "'No,' I said. 'The cathedral.'" Waugh's fastidiousness did not extend to declining freebies. Running low on money for a stay in Malta, he wrote ahead to two hotels asking for free lodging in exchange for a plug. The proprietor who hosted Waugh showed him a previous hack's cloying praise as an example of the sort of stuff he hoped Waugh would write. Waugh responded with an endorsement as honest as it was faint. "I will not be outdone in gratitude," he declared. "If my appreciation is more temperately expressed, it is none the less genuine. Let me state again, the Great Britain may be less suitably placed for golfers than Gleneagles; the bathing may be better from the Normandie; one can shop more conveniently from the Crillon, the Russie is set in a prettier square, one meets more amusing company at the Cavendish, one can dance better at the Berkeley and sleep better at Mena and eat better at the Ritz, but the Great Britain Hotel, Valletta, Malta, is the best on the island; further comparisons seem rather to confuse the issue." Waugh clearly didn't take his travel writing as seriously as he did his novels, nor should anyone else. If Waugh in Abyssinia is marred by his pro-Italy take on the invasion, it was also where the hilarious telegraph exchanges between the clueless war correspondent Boot and his London editors in Scoop originated. Beyond their intrinsic value as travel writing, the narratives in Waugh Abroad are a superb opportunity to see at close hand the mind of the real-life Waugh at work. Bill Beuttler is a freelance writer in Swampscott.